Victor Espinoza, the self-proclaimed “happy Mexican,” seemed no more ebullient than usual at Clockers’ Corner Thursday morning, four days after he and fellow jockeys Javier Castellano and the late Garrett Gomez were elected to the contemporary category of racing’s Hall of Fame, along with three-time Breeders’ Cup Mile winner Goldikova. “I’m excited,” said the native of Mexico City, who turns 45 on May 23. 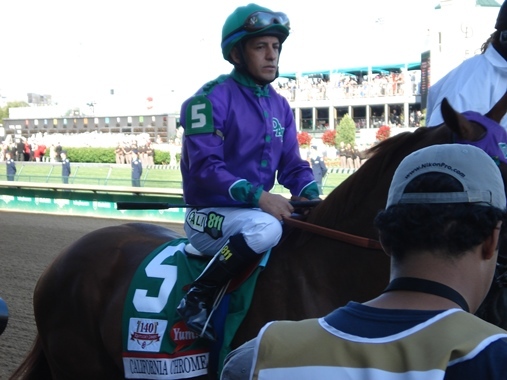 “Every jockey wants to be there, but for me, it was more important to win the Triple Crown. The Hall of Fame is a bonus. The induction ceremony will be held Aug. 4 at Saratoga Springs, N.Y.
Espinoza was proud to be voted in with four-time Eclipse Award winner Castellano, 39, and 13-time Breeders’ Cup winner Gomez, and despite his age and achievements, does not have the “R” word on his immediate radar screen. 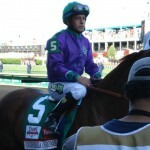 “I want to continue to ride,” said Espinoza, who is represented by agent Brian Beach. “I’m dedicating myself very hard right now, especially for the Kentucky Derby. I’m focused on that and working even harder than before. Bob Baffert, who gave Gomez a leg up on many a stakes winner, as well as Espinoza, who rode Baffert champion American Pharoah to the first Triple Crown sweep in 37 years in 2015, was fully on board with their election. “Unfortunately for Garrett, he wasn’t able to enjoy it,” Baffert said of the winner of 3,769 races with purse earnings of $205,224,899, who was found dead Dec. 14, 2016, in Tucson, Arizona, at the age of 44. “He definitely deserves to be in there. “Not only was he a great rider, but a good friend. He was a lot of fun to be around. “All I can say about Victor is, not only does he deserve to be in it, he’s going to have the biggest plaque ever as a jockey, because he’s ridden some really fantastic horses (most notably American Pharoah and two-time Horse of the Year California Chrome).